In early 2011, I was flying in Flight Simulator and I realized that while my passengers embarked or disembarked, they always heard the same songs of FSPassengers, and always in the same sequence. Then I decided to create an application that offered me more options to vary both the songs and the sequence in which they were executed. It was the birth of what I called FSPMusic. In mid-2011 I’ve bought the FS2Crew Voice Commander Edition for the PMDG 737 and I was annoyed, since the voices of both the flight attendants of FS2Crew and FSPassengers overlapped. I decided to make an application again to solve this problem, since I would not be enough to erase the lines of the commissioners, because I use another aircrafts which do not use FS2Crew. 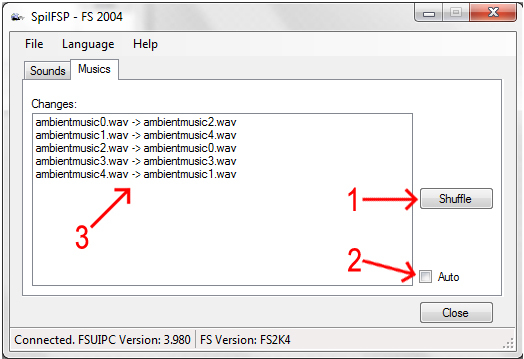 Then SpilFSP was born, which also includes the module FSPMusic into a single application. Install the application by running the Setup.exe. Choose the folder where it will be installed. After installation, double click in SpilFSP shortcut. Under the tab "Sounds", the point "A" shown the “in use” aircraft on simulator, at point "B" is generated a list of all installed aircrafts on simulator. Select in the "B" point the aircrafts where the FSPassengers audio will be suppressed and not be heard during the flight, then click the "C" button to save the changes. If you want to select all aircraft, click on the "D" and if you want to clear all your selections click the "E" button. Under the tab "Musics", the button "1" tarts the process that randomizes the order of songs for boading and unboading in FSPassengers. Can be placed up to 100 tracks, the files must be named in this format: ambientmusicX.wav, where "X" is a sequence number that MUST start with "0". Ex: ambientemusic0.wav, ambientemusic1.wav, ambientemusic2, ..., ambientemusic99. The checkbox "2" triggers the automatic mode, when it is selected the scramble of the order of songs happen every time the plane's main door is opened (SHIFT + E). To scramble again, just close and open the front door. In the "3" will be listed all the songs in the format ambientmusicX.wav. On the left, shows the order before the scramble and in the right side, the order of how they were later. 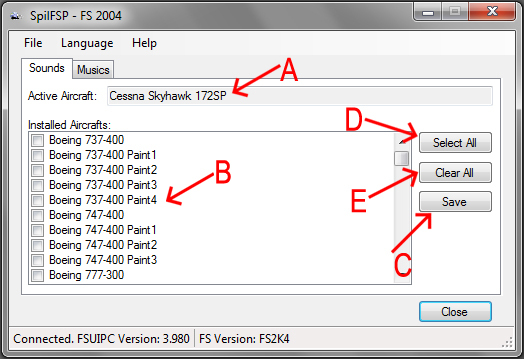 "FsPassengers\Sound\CrewPack\Default” in the main installation folder of Flight Simulator. The files must be in the format “.wav” (PCM, 64.0 Kbps, Mono, 8 bits, 8 000 Hz). In the Language menu, you can choose from: English, Portuguese, French, Italian and German. (In the event of any translation error, please send me an e-mail with the correct translation: support@spilfred.com). Comments and criticisms are welcome. This application has been tested and programmed for the 2004 version of Flight Simulator, but I'm working on a version for FSX. In a future update, a single application will support both versions. I hope this little project is useful to virtual commanders as it was for me. This software is available for download at: “http://www.spilfred.com” and is free to download and can be copied and distributed provided it does not change the claims of authorship. (Please always download from site: http://www.spilfred.com. Your access helps to cover the hosting costs). Good flights and good fun.